Why this tip is awesome? Because when you have collected 500 shovel points, you unlock awesome items and have a storage space for 500 items! So lets get to business and start collecting these shovels! 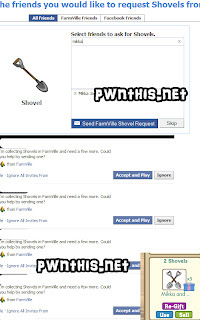 Log in your main account and load Farmville. Go to your Storage cellar and click 'Ask for shovel' (only lvl 16 and above can purchase the storage cellar). Open as many tabs as you want without your browser crashing. The more tabs you open, the more shovels you get. Copy the url and paste it to the tabs you opened. Do this for ALL the tabs first BEFORE clicking the final SEND button. Once all tabs are on the SEND screen, click SEND for all the tabs. 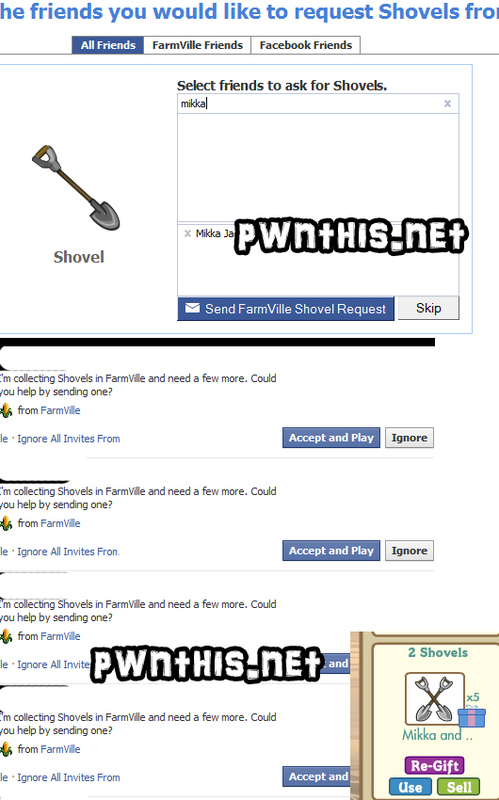 Now just log into your dummy account and accept all the shovel request. Now log in your main account and you should see all the shovels in your GIFT BOX. A tip that I found out is that... your dummy account that got the shovel prize in step 10, you can Re-Gift those shovels to your main account! Remember: That you can only use this glitch once per day,so open a lot of tabs to abuse it!